Some surprises are fun. Something that is NOT fun is working on a Word document for a while, then a sudden power outage shuts off your computer, and you realize you never saved that document. But there’s good news! You can probably get it back! Actually this alarming situation might happen due to a brief loss of electricity, but sometimes it can happen just because of user error. You create this big document, then you go to close it, and in a brief lapse of focus you click on “Don’t Save”. So guess what – Word doesn’t save it. It’s just gone. Or rather, it APPEARS to be gone. There is still hope! On this blog and on my podcast, I do complain a lot about Microsoft because of the way they do things. And it’s deserved. But in this case, Microsoft got it right. 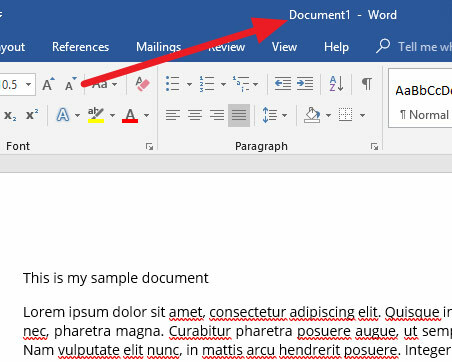 This feature has saved a lot of hours of work for MS Word users. To show you how it works, I’ll go through the exact process of losing and recovering. First, I’ll create a new Word document. 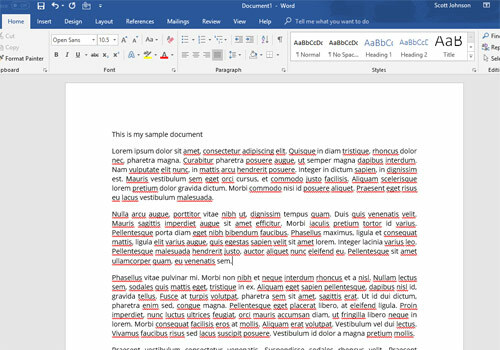 I started it with one line: “This is my sample document” Then I just added 5000 words of Latin “filler text” that I copied and pasted from Lipsum.com (a great source if you ever need a bunch of dummy text for a document or a website). This is a large document. Typically if a document is 5000 words, it means I’ve spent a lot of time creating it, and I definitely don’t want to do something stupid and lose it. And speaking of stupid, even though I theoretically have spent so much time on this, I have never once clicked “Save” to save the document and give it a file name. Now I’m going to click the X in the top right corner to exit this document and close the MS Word program. 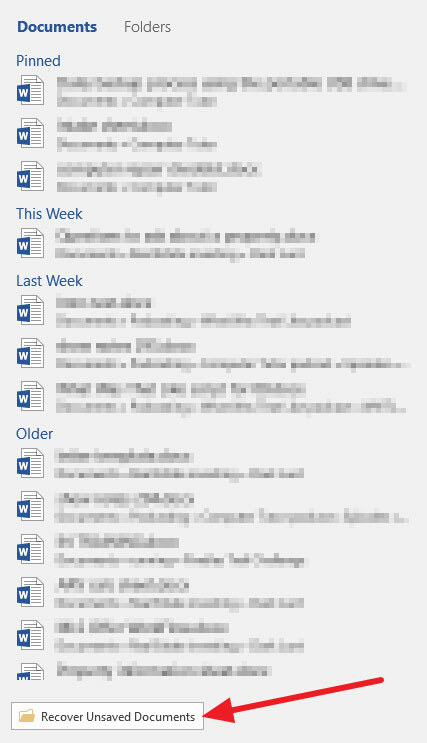 Of course I get the question, “Want to save your changes to Document1?” but I absent-mindedly click “Don’t Save”. And of course, that’s when the panic would suddenly strike. Did I really just delete hours of work with a single click? Do I have to do it all over again? Click to open MS Word. Then look at your list of recent documents. At the bottom of that list, click on “Open Other Documents”. 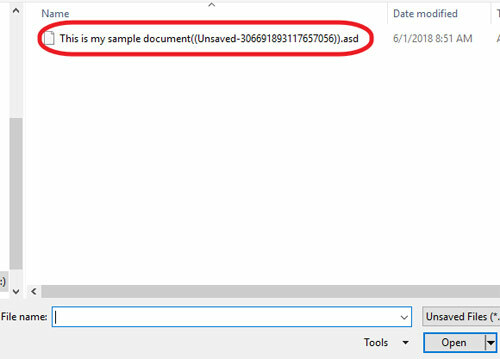 So I select that document and click Open, and I have the file back on my screen so I can actually save it with the proper name and in the right location in the Documents folder. Disaster averted! WARNING: Word does not save documents like this forever, so don’t wait! As soon as you realize what you’ve done, go through this process and save it the correct way so you’re sure you have it back. I use Office 2003. Could not find the path to unsaved word documents. Different protocol for earlier versions of Word? Thanks. Hi Mike – yes, very different – Office 2003 is very outdated and not safe to use. I recommend getting the newest version of Office. I tried to use the recovery of a document I created for testing the recovery. It didn’t show up when I clicked on ‘Recover Unsaved Documents’. I tried it a couple of times. I’m use Microsoft Office 2010. Otherwise the program works fine and I still get security updates periodically for it. Yes, the process in the blog is based on Office 2016. Probably works on Office 2013 also. Technically Office 2010 is still usable, but it’s pretty outdated now (I have not tried the “recover unsaved documents” in that version since I no longer have it). 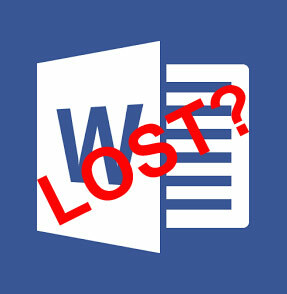 I just listened to the podcast ”How to recover an unsaved Word document” , and I believe there is one important detail you left out. You should inform your listeners that the recovery of an unsaved document will only work if the AutoRecover setting in Word is turned on, and that it has a low value, say every 1-2 minutes. If it’s set to every 10 minutes or longer, it will only start auto-saving your document after 10 minutes from when you started to work on it. If you close document without saving it before an autosaved document is created, you will not be able to recover your document.